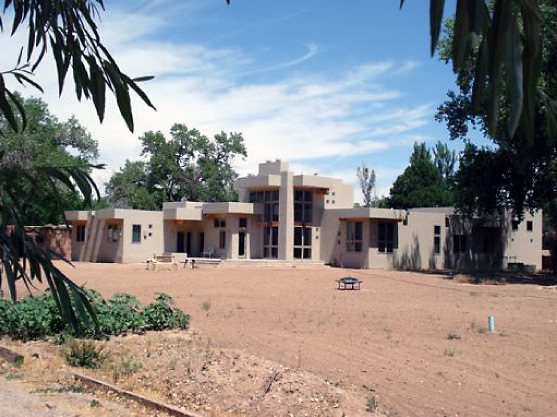 The Owners found land along the Rio Grande River State Park "bosque" cottonwood forest with a number of majestic mature specimens between large cleared areas. 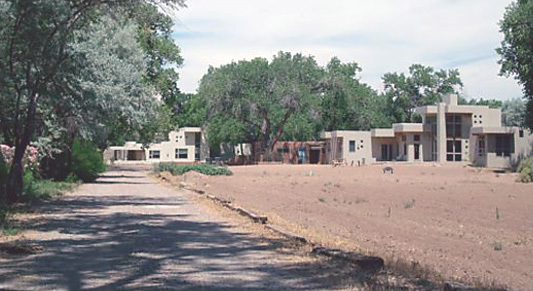 The project mission was to build two houses among the trees with a third parcel for possible future development. 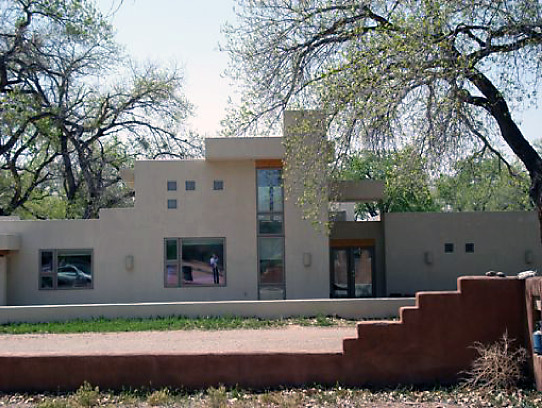 An existing dwelling, "The Guest House," was to be upgraded for parents of the Owners. Landscaping Concept/Ecology: The site will be returned to its natural state as a cottonwood forest. To recreate the original natural setting numerous trees will be planted in clusters alternating visual buffers with bright clearings, shade and sun. Site Solution: Land parcels and house envelopes were planned to retain two large open exterior areas as shared visual fields. Main House and Guest House are paired to define these open segments - west toward the river and east toward the mountains; the common entry drive makes both a part of the daily commute. The Main House/Architecture: The continuous den, living room and dining space wraps around a central core with two fireplaces and entertainment center, bounded by the large kitchen and social island. 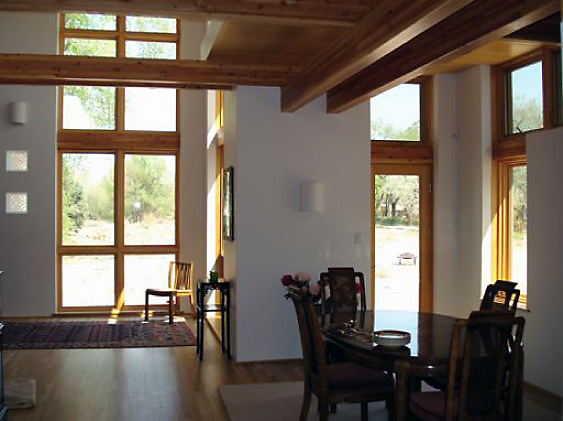 Tall east windows capture the mature cottonwoods and winter glimpses of the mountains. 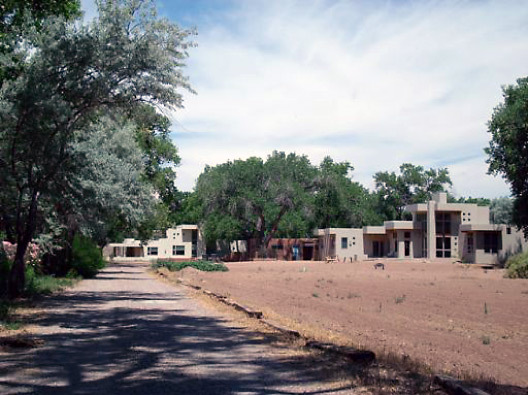 A high private covered porch sheltered under the largest cottonwood on the west looks toward the bosque. 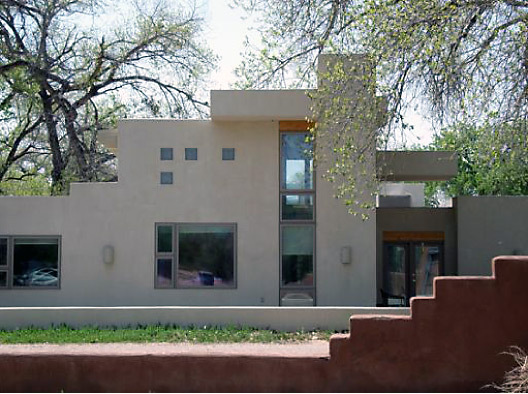 The Guest House/Architecture: This existing dwelling was redesigned with a master bedroom addition, an enlarged tall living area with entry foyer, dining area and new kitchen. 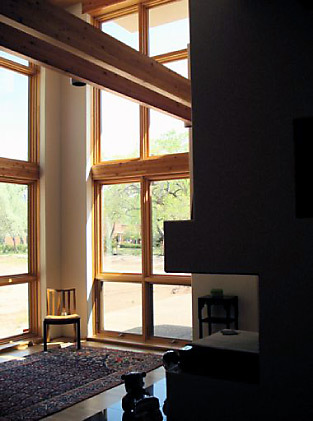 An array of east windows opens bright views of land and trees to the east. 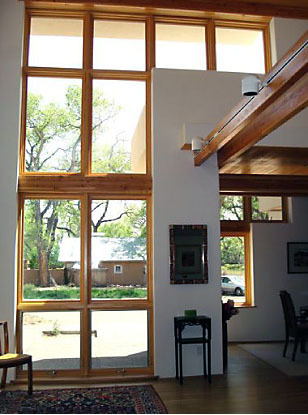 The shaded entry drive provides a focal connective activity element. 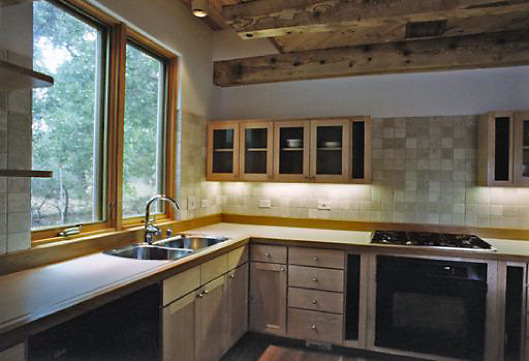 Solar Design, Phipps Compound: Glazing is located for winter passive solar gain and views. 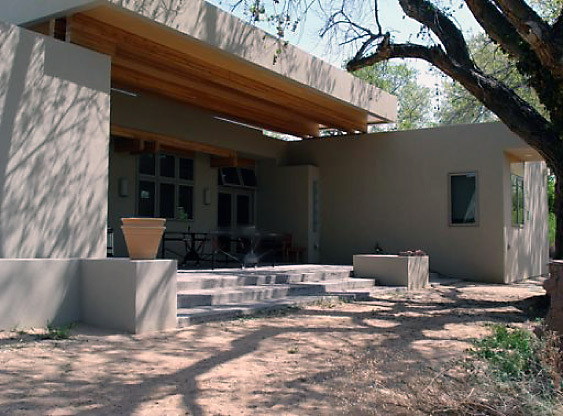 Large deciduous trees and cantilevered shade overhangs are used strategically for summer load reduction. 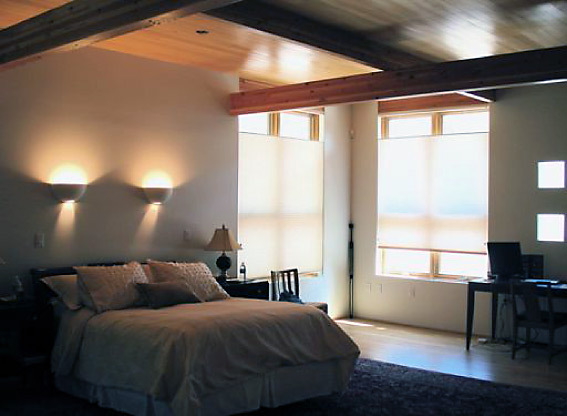 Energy Conservation/HVAC: High performance low-e glazing thoughout. 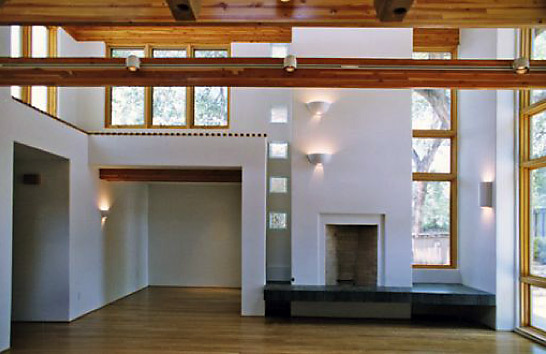 Operable living area clerestory windows for sumer night time cooling. 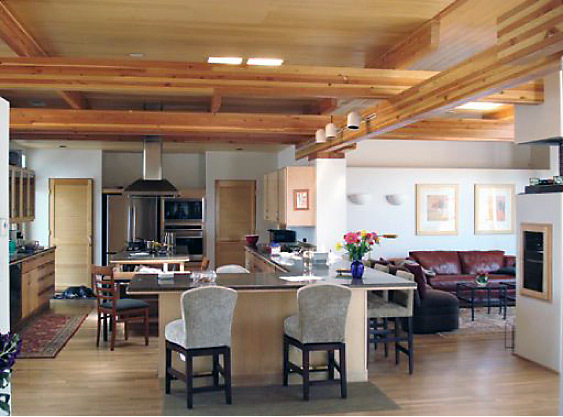 Efficient natural gas radiant floor heating. R-40 roof insulation. 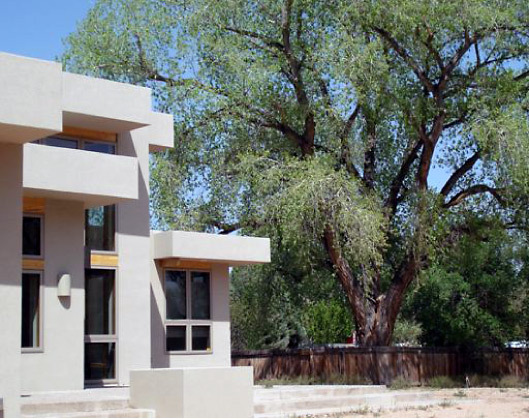 Ecology: The site will be returned to its natural state as a cottonwood forest.